3MT Ontario will take place in the Sandra Faire and Ivan Fecan Theatre located on York University's Keele campus on Thursday, April 19 - 9:30am (Reception), 10:00am-12:00pm (Presentations). A lunch reception for presenters will follow at the Schulich School of Business' Executive Dining Room, located adjacent to the theatre. Several buses and transit companies are routed through the campus or have express services to York. The York University subway station on the TTC Yonge-University Line is located directly adjacent to the Sandra Faire and Ivan Fecan Theatre. For an overview of all public transit options available, please visit Transit Directions. 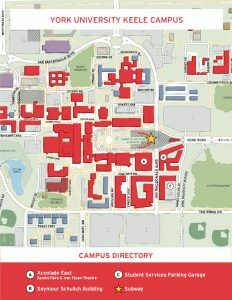 Note: Drivers are encouraged to park in the Student Service Parking Garage which is location C on the printable map below. It is accessible off James Gillies St and costs $20 for the day. For an overview of written driving directions, please visit Driving Directions. This printable PDF map is a handy guide to the primary locations for 3MT Ontario 2018.